A few years ago i bought this. It was in pretty shocking condition..brush painted ....everything seized ie seatpost,forks,handlebars,rear swingarm etc etc. Bent frame rusty wheels which were beyond saving. Snapped rear axle...sturmey 4 speed hub which sounded unsurprisingly like a pepper grinder and was locked permanently in 4th gear. It was my pleasure and duty to pick them up every afternoon the route involved a mainly straight ride along a shared footpath/cyclepath with a short but very steep hill close to my house. A year before id suffered a heart attack so wanted a easy low geared lightweight bike which i could gently spin to pickup the girls at about 9mph then cycle alongside them at walking pace whilst carrying their heavy school bags on the bike. It needed to be easily manoeuvrable amongst a hundred or more milfs and be unappetising to thieves. Primarily it needed to be cheap to buy reliable upgradeable and most importantly cool different and RETRO! 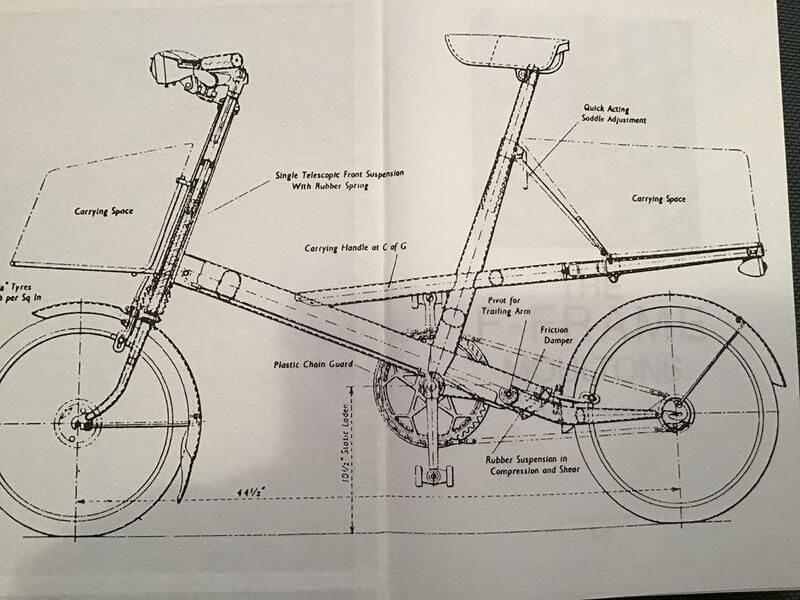 Enter the 1968 Moulton f frame. All boxes ticked then.....please let me know if You would like the next installment of my journey into small wheel obsession. Vespa pk50 polini 75 cc highlytuned. Lots of bicycles..and boats an vintage hifi. Vespa pk50 xl2 needs tuning! The seatpost was well seized but eventually yielded...it was the old style with the seperate clamp which then clamps to the saddle rails (if you know what i mean). Replacing this with a more modern “micro adjust” alloy version was problematic due to the 25.8 mm diameter as opposed to 26mm on modern posts but i managed to get hold of a suitable one eventually. The wheels where the next issue..the originals where chromed steel and whilst reasonably true the chrome on the braking surfaces was shot. Years ago when i was a nipper i remember my local bike shop had a display of a solid tyre prototype on the counter (complete with nail and hammer) excellent idea i thought in my youthfull innocence....Nah load of rubbish proffered the shopkeeper “may as well ride on your bare rims” he scoffed! Oh well maybe one day i thought. Following an internet interlude i discovered the modern equivalent “tannus tyres” reviews were mixed but generally positive and i reasoned that the full suspension on the moulton may alleviate any inherant harshness in the ride..also repairing punctures and stretching a cold tyre onto a 16” rim is a long painfull drawn out procedure at the best of times let alone when you’ve got two little darlings waiting in a cold playground with a quietly angry teacher who just wants her tea! 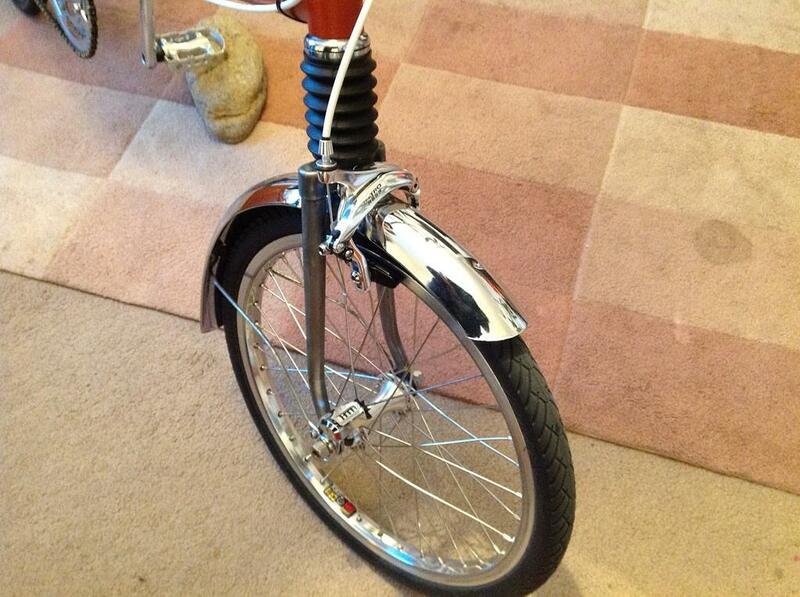 New wheels and solid tyres...chrome mudguards cleaned up beautifully with autosol! More later! I use Tannus tyres on my fixed wheel bike for the same reasons . They soften up slightly with use . 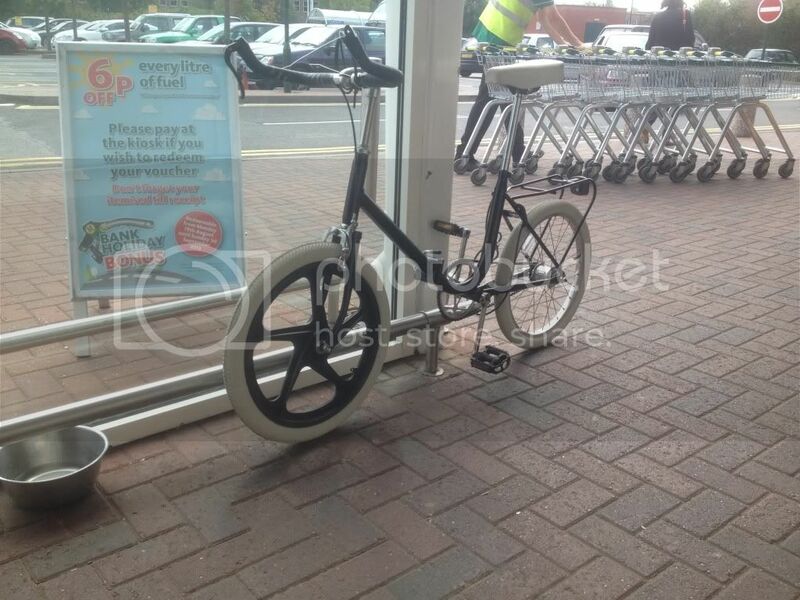 I’ve also got a Raleigh RSW MK2 that i use at car shows . Once did the local critical mass ride on it . 11 miles & it was surprisingly comfy !! 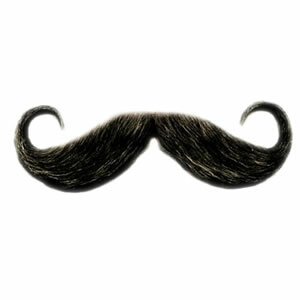 zeberdee. 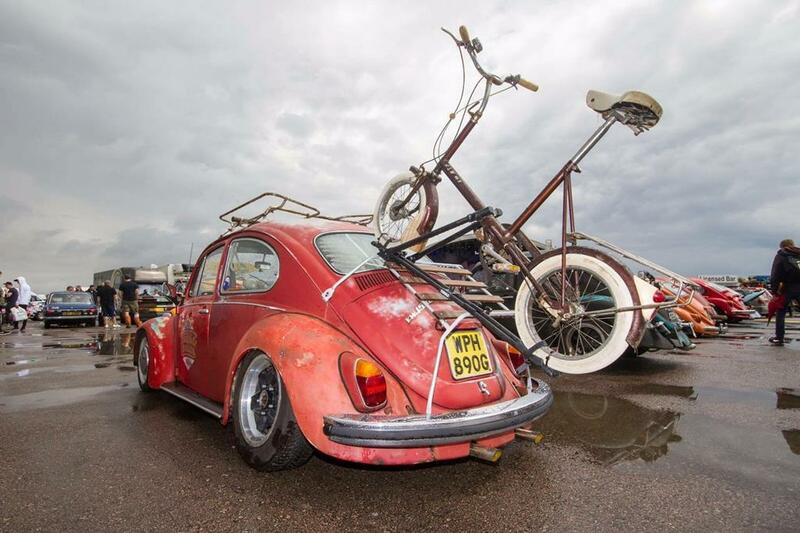 Hi mate thanks for posting that..i must say the rsw looks fab on the back of your beetle...Its highly relevant and appropriate too as the Rsw (Raleigh small wheel) was raleighs answer to the Moulton. At one point Moulton was Britains 2nd largest frame builder after Raleigh. The moulton formula of small wheels with high pressure tyres and full suspension was a winning one with the public and Raleigh wanted a slice of the action. Dr Alex Moulton was a smart cookie though and his unique suspension system was protected by many patents. 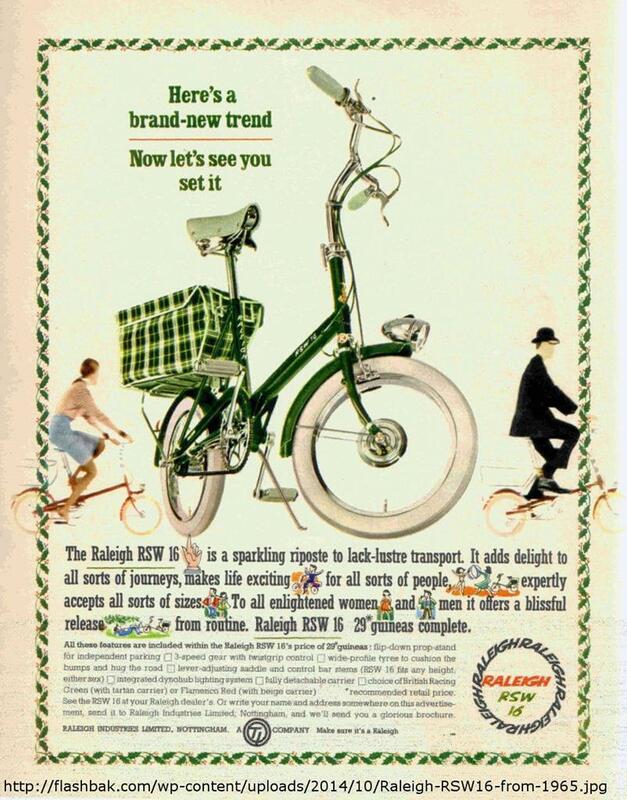 Raleigh needed a small wheel bike in its range and being unable to utilise suspension in order to alleviate the harsh ride inherant in 16” wheels they took the easier option of using balloon tyres running at much lower pressure (35 psi as opposed to 60 on the moulton). It was cheaper to build and became a runaway success leading to a drop in sales for Moulton. Raleigh later bought out Moulton and produced both models alongside one another before eventually dropping the Moulton. Oh yes I forgot to mention that Dr Alex Moulton was the genius behind the Hydrolastic suspension used on the Mini and Later the hydropneumatic system. As well as the flexitor suspension used on many trailers and caravans. 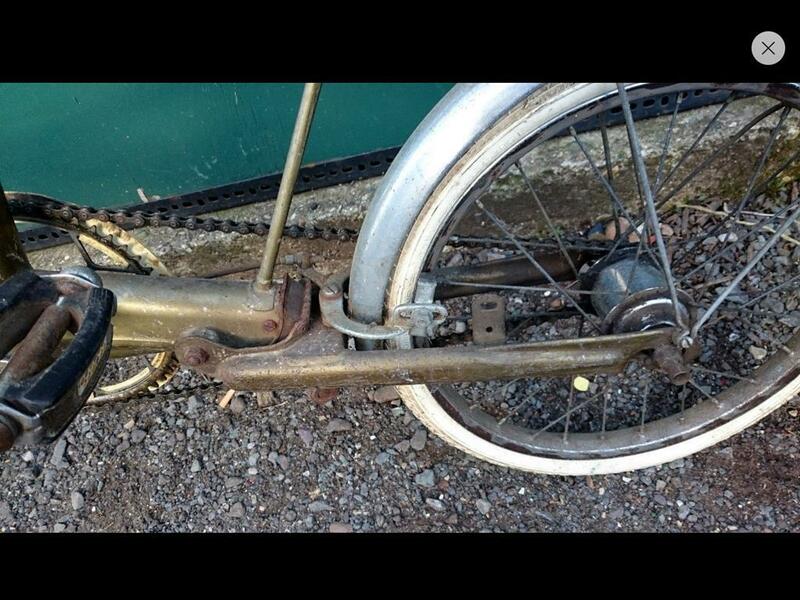 Yay a Moulton Tsr2 seperable bicycle! I just couldn’t help myself!! I rode an RSW16 to primary school day in day out. My mates all went by car and were jealous as they werent allowed to lol. That Tsr2 looks amazing !! Interesting, keep updating us when stuff happens. 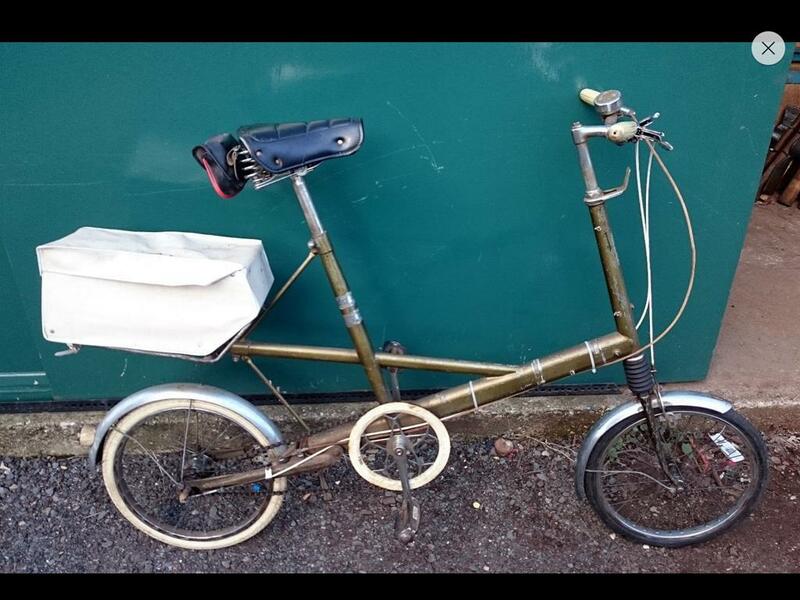 My dad has had a Moulton for years, well several actually, I haven’t ridden a bike much since being allowed powered vehicles! I used to have 5 Early Moultons in the 90s,actually used one on my commute for awhile. i had a modified sturmery archer hubgear, it was a 4 speed but i found away to make a 5 out of it, and i had the front rack for it as well as the rear. Had one of the 60s "folding" ones where the frame was split in the middle. Fond memories of them now, i only have the front rack left out of the collection because of the rarity of them back then. I'd be interested to learn how you made a 5-speed out of a 4-speed SA hub! 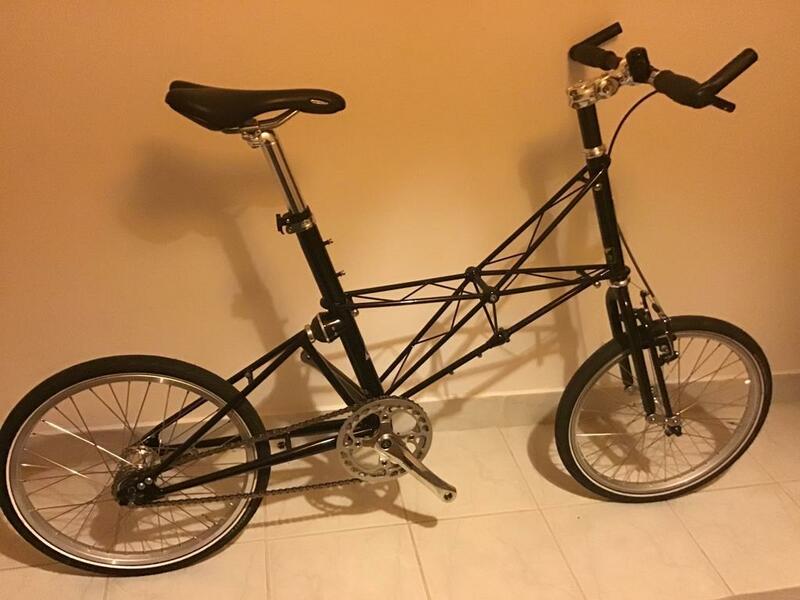 I have a little Saxon Safari folding bike with 16" alloy wheels, found on a scrap pile, just needing new tyres and a bit of TLC. Hi gtviva its funny you should say that because that’s exactly what i do....when its not being used its on the wall! Its better than watching television! ps the seperable version of the f frame was called a “stowaway” many were produced but it is difficult to find one in good condition as the frame split in the middle and was secured by one bolt...this would often be overtightened or more often work its way loose over time leading to a loose joint,ovalisation of the hole in the frame leading to movement leading often to catastrophic frame failure! not the fault of the design in my opinion rather the lack of understanding that the average user had no mechanical sympathy. we don't need to think...if it breaks its because you dropped it! 8-)Finally for tonight a Massive thank you to everyone for showing interest in my ramblings....theres loads and loads more where this came from! Id better put another picture of tsr2 goodness on before i sighn of eh? Thats my lovely Daughter Emily posing there and i hope you appreciate the fact that she is wearing what we considered to be 1960s period clothing...its important....apparently! 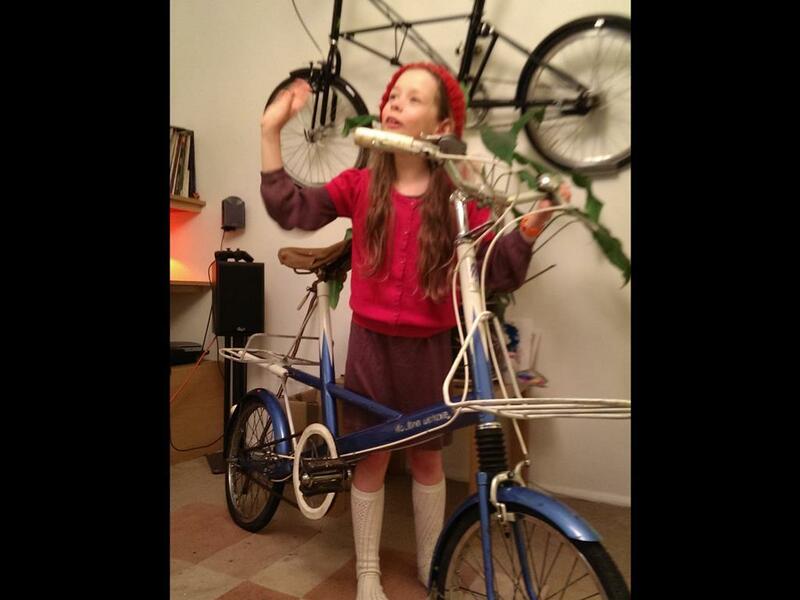 But hey hang on a minute isnt she posing with ANOTHER Moulton?.......a totally original 1964 “barn find” rivetted frame made in bradford on avon hand builddeluxe? Have i even finished the first one? Am i getting carried away..is this developing into an unhealthy obsession...and am i sleeping in the spare room for the rest of my life? Looks like you’re doing it right . As an industrial designer/ researcher specialising in user interaction, I'd say this is something the designers overlooked. I haven't studied this particular issue, but I'm sure a mechanical forcing function could be implemented in the design to prevent over-tightening. 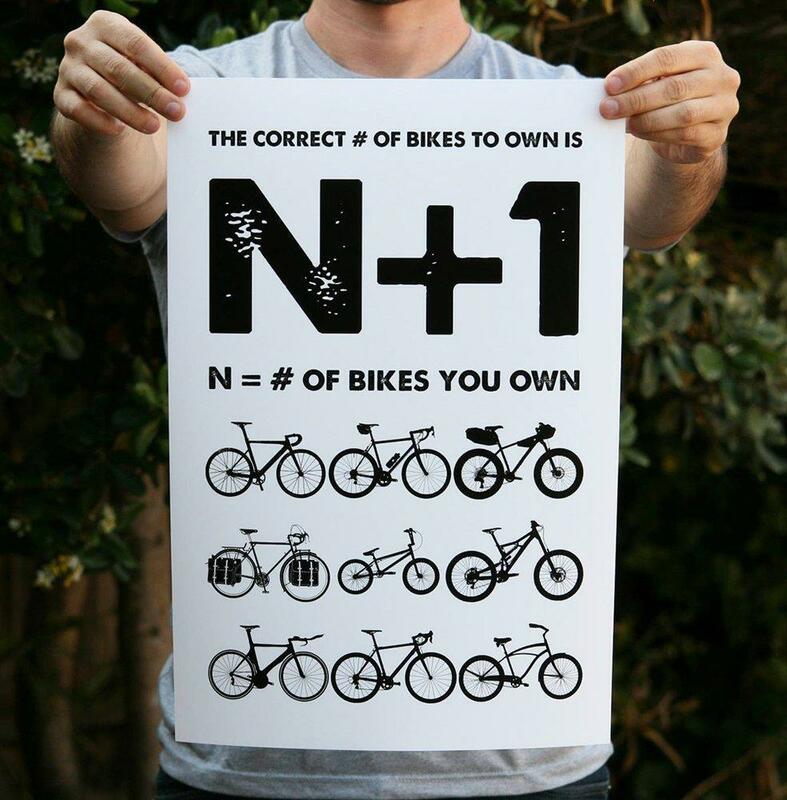 In my opinion a bicycle should "just work", even for users with a total lack of mechanical sympathy. I have four small wheelers and a few parts bikes (none of them British) and I love them. I live very close to Bradford on Avon and I've been meaning to visit the Moulton Museum in the library on multiple occasions, but it seems every time I try they're closed! 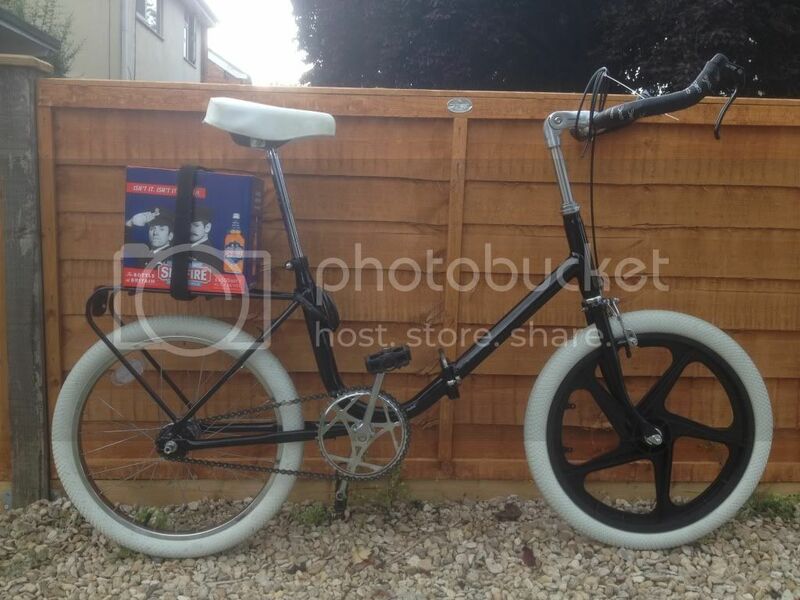 Would love to add a Moulton to the collection one day. Good point well made but I am ashamed to admit a fundamental error in my post to which you refer...actually the problems with the frame were caused by the average user under tightening the bolt rather than overtightening. I believe there was the provision you describe to protect against overtightening but ......and I'm guessing here!! The tightening of the bolt was facilitated by the use of a specialy provided spanner. This was something the designer DID overlook so we are both right although i was wrong by saying overtightening when i should have said under tightening! Your post got me interested enough to spend two hours on the web researching forced function and user interaction....fascinating stuff! How do you implement your knowledge? And how will you explain to my wife that the reason her bathroom has not been regrouted is down to you getting me interested in finding out more about your field of operations? Regarding your small wheelers i think I'm not alone in hoping you will post some pics and info...id like this thread to be for everyone whos into small wheels! If you’ve got it...post it! I'm pretty new to this whole forum thing...but I love the exchange of ideas,inspiration,experience and knowledge that is here so keep it coming please! Now a message to everyone reading this thread! Apologies for the length of time it takes me to respond to everyones replies the original f frame at the beginning of this thread was started a few years ago! Unfortunately this involves booting up ancient laptops and finding leads for long unused cameras..... please bear with me and with this thread! 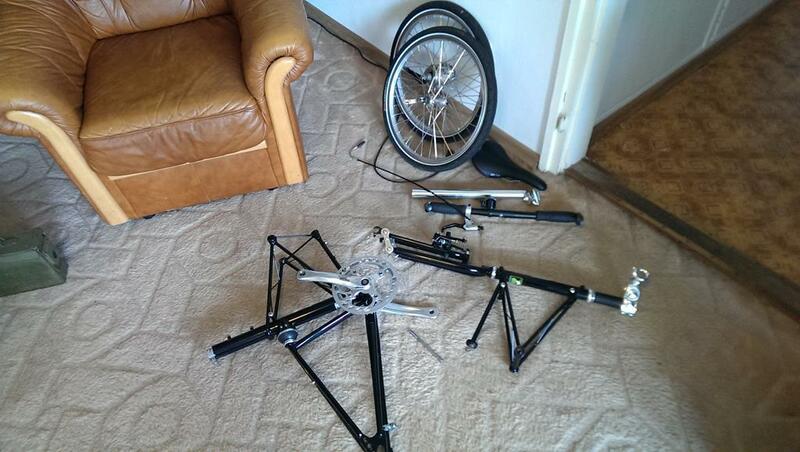 Brompton world championships. Happened across it when my son did the junior bike race around St James' Park as part of the Ride London festivities a few years back. The Bromptons were on first. Hundreds of them. In fancy dress - lycra banned! Some of them were really going for it too. Remarkable sight - couldn't stop grinning! I love a cheeky little folder!! 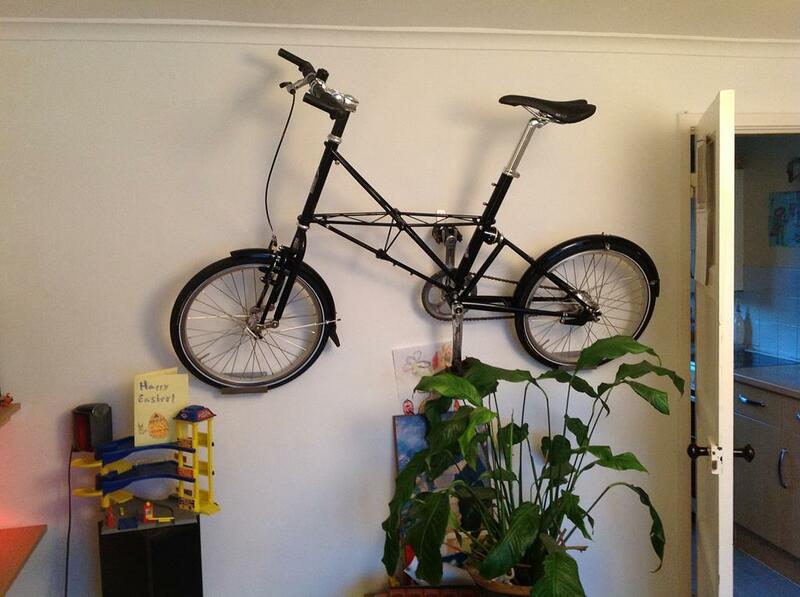 Love the folding bike! 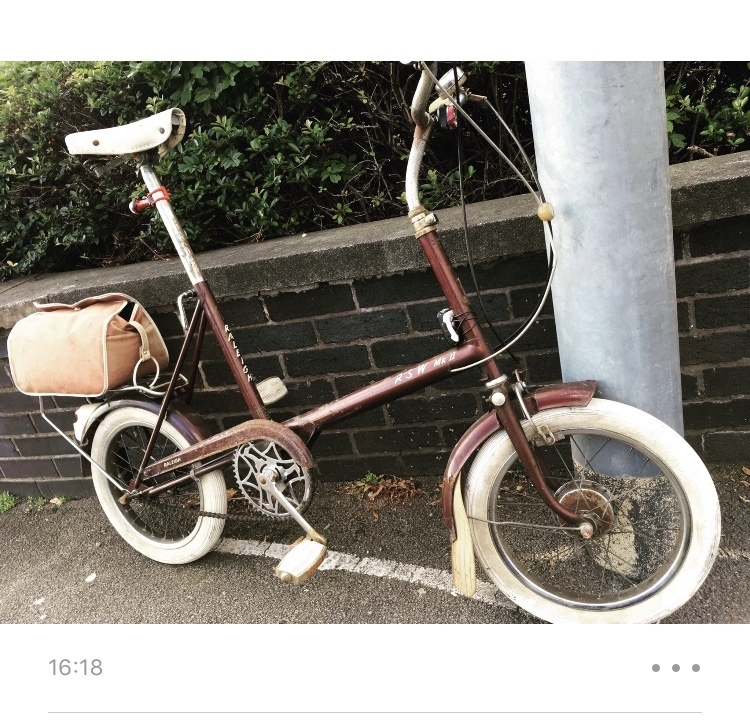 I bought my Hercules for a fiver from the local tip, spent a bit on it but now it's my favourite means of zipping to the shops.